Calgary – September 7, 2016 – Keeping a wonderful tradition alive, UFCW Canada activists were loud and proud at the 26th Annual Calgary Pride Parade this past weekend. Ottawa – August 24, 2016 – The rain couldn't dampen the spirits of UFCW Canada activists who participated in this year's Capital Pride parade in Ottawa. Charlottetown, P.E.I. – August 6, 2016 – UFCW Canada activists in the Atlantic region recently celebrated with hundreds of other participants at the PEI Pride Parade in downtown Charlottetown. Vancouver – August 4, 2016 – Members, staff, and officers from UFCW Canada Local 1518 were loud and proud at the 38th annual Vancouver Pride Parade on July 31, where UFCW activists handed out whistles and waved to spectators as part of a multi-union delegation that participated in the event. 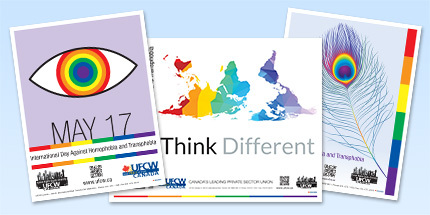 Halifax – July 28, 2016 – UFCW Canada Atlantic activists proudly joined thousands of other participants at the Halifax Pride Parade in downtown Halifax on July 23. Toronto – July 4, 2016 – UFCW Canada activists from across the Greater Toronto Area were out in full force for the 36th Annual Toronto Pride Parade.